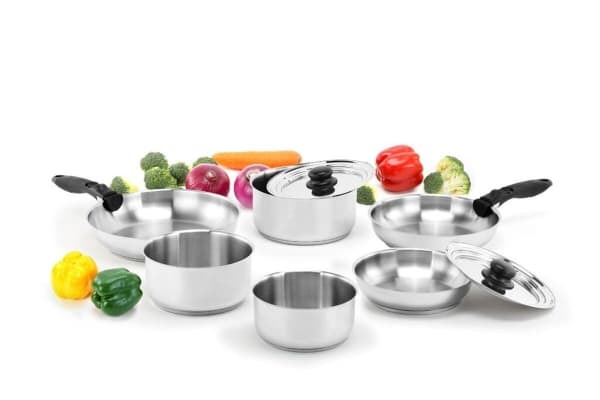 A space-saviour for any modestly-sized kitchen, this premium quality stainless steel cookware set will help you create chef-inspired, gourmet-worthy dishes without taking up precious kitchen space. 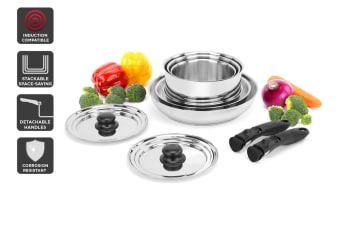 Ultra-durable, polished stainless steel that’s built to last! 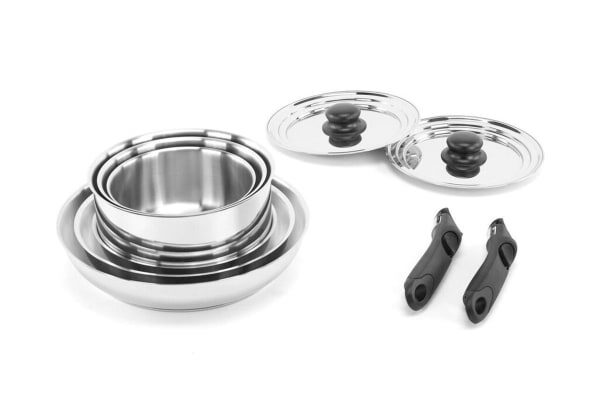 Built with premium quality stainless steel, switch from stove to oven with ease thanks to the Ovela Moderno 10 Piece Stackable Stainless Steel Cookware Set, perfect for dishing up rich, creamy pastas and fall-apart lamb roasts without taking up precious cupboard space. Give your kitchen a finessed professional edge with this premium set, featuring an ultra-durable stainless steel design that won’t discolour or stain. There’s no need to worry about metal scrubbers or tough stuck-on-grit chipping away at the surface of your frying pain either! The handle clamps on effortlessly and the vice-like grip remains secure no matter how heavy or hot the pot gets, simply remove the handle when popping into the oven or stacking to economise cupboard space.